Amaranthus is an example of a C4 dicotyledonous plant. Note the large bundle sheath cells, (BS) which contain large chloroplasts. The mesophyll is described as radiate and is referred to as the Kranz mesophyll. These Kranz cells, contain smaller chloroplasts than the underlying bundle sheath cell chloroplasts. Note that stomata (S) occur on adaxial and abaxial leaf surfaces. Study the simple diagram to the left below the micrograph. This will help you understand the relationships between the various layers making up "Kranz anatomy". The KMS (Kranz mesophyll) cells are intimately associated with the BS (bundle sheath) cells, and photoassimilated material (usually in the form of malate or aspartate) is passed through to the bundle sheath cells, via numerous plasmodesmata, which occur at the interface between the bundle sheath and Kranz mesophyll. 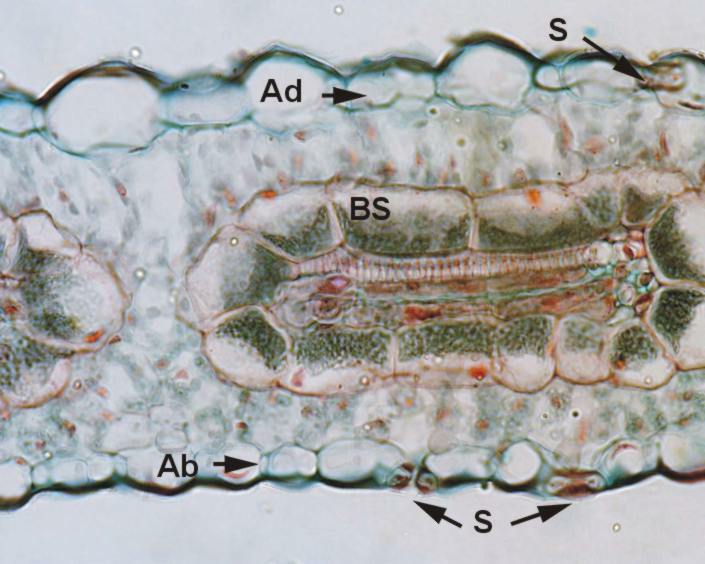 Then you need to study the difference, as this leaf cross section shows the compartmentalized anatomy and structural arrangement required to support the C4 photosynthetic pathway. Question: Can you highlight the structural differences between C3 and C4 photosynthetic plants?